Think Up was commissioned by the Royal Academy of Engineering to research and write three best practice guides on the teaching of engineering in higher education. This report provides practical suggestions to the people and organisations involved in the commissioning, design and use of e-learning resources in engineering education. 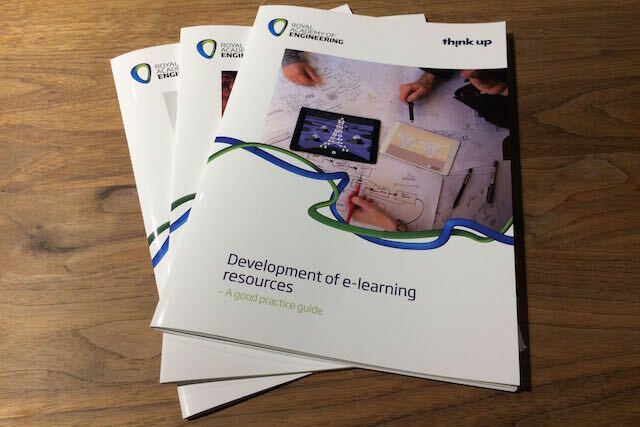 The report identifies the main challenges encountered in the use of e-learning approaches and provides a reference that commissioners, developers and users can dip into to find best practice suggestions. The need to improve the quality of engineering education to meet the needs of industry and the expectations of students is well established. In this context, there is a strong case for exploiting the opportunities made available by e-learning to enhance the learning experience of engineering students. But despite the potential benefits, many students and teaching staff would argue that developing or accessing suitable engineering e-learning resources can be challenging. This guide addresses these challenges by providing people developing e-learning resources with useful information and practical support. Taking a project process view of e-learning resource development, we have structured the content in this guide around three phases in the development process: commissioning, production and operation. The first section of this guide presents an analysis of the current state of play in the development of e-learning resources, identifying the challenges faced by commissioners, developers and users. The second section of the report provides suggestions and guidance to commissioners, designers and users for overcoming these challenges. While this guide can be read cover-to-cover, it is really intended to be a quick reference for commissioners, developers and users of e-learning resources, all of whom can look up the appropriate section to find the information they need.